This is just a post to preserve some old backdoor programs i wrote 10+ years ago that I used to mischievously learn programming and windows API. I no longer have the source for anymore. If I can dig them up I’ll post with the binaries. a 2.45kb trillian pws thats sends user names and passwords to your icq number. a 1.35kb app thats sends half life cd-key to your icq number. a 1.26kb program that silently installs Radmin on a remote computer for win9x/me/nt/2k/xp. 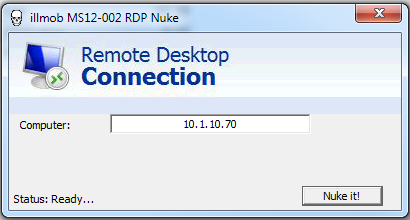 basically it downloads the radmin server and dll from the web and adds the proper registry keys for it to function. Generates a dropper that silently installs Radmin on a remote computer for win9x/me/nt/2k/xp.Extracts the radmin server and dll from itself and adds the proper registry keys for it to function. (default pass is 12345678). Self-deletes after installing Radmin.